FurReal Roarin Tyler, the Playful Tiger – Walmart Price Drop! Kellogg’s Pop-Tarts Only $1.26 Each at Walmart (Regularly $1.76) – Print Now! 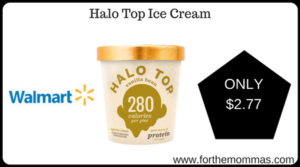 The post Walmart: Halo Top Ice Cream Only $2.77 (Reg $4.64) appeared first on FTM. Hop on over to Walmart.com where you can score up to 75% off 16-piece dinnerware sets, with prices starting at just $11.14! These dinnerware sets would make a nice gift for kids heading off to college or getting their first apartment. Store rice, flour, sugar & more in these OXO containers! Head up to your local Walmart where you might find Mainstays Kids Reversible Microfiber Comforters for possibly only $9 (regularly $17.88)! Watch for a hot buy on a Razor Scooter while you’re there! Fisher Price Think Learn Bot ONLY $11 At Walmart! My Life Soccer Doll ONLY $7 At Walmart! Check This Out!